The Arctic Circle is a fickle thing. For most that have spent even a moment thinking about it, it's probably just known as the "line" related to the sun setting at the solstice...or some such. The actual definition is a bit more complicated, but can be summed up as the line that marks the northernmost point at which noon sun is just visible on the northern winter solstice...and the southernmost point at which the midnight sun is just visible on the northern summer solstice. But...it gets a little more confusing the more you dig into the details. 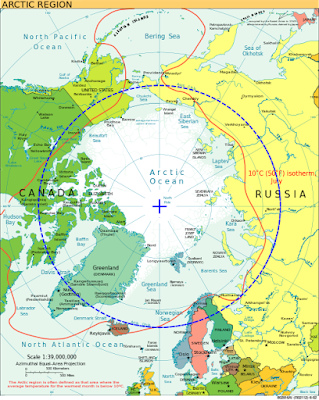 Looking at a basic map showing the Arctic Circle, you can easily pick out the countries that find some part of themselves above it, and within the "Arctic". Very easily, one can pick out the US (Alaska), Canada, Greenland (Denmark), Norway, Sweden, Finland, and Russia (as well as a few other island and archipelagos like Svalbard, Franz Josef Land, etc). This map clearly shows the entirety of Iceland falling just below the Arctic Circle. 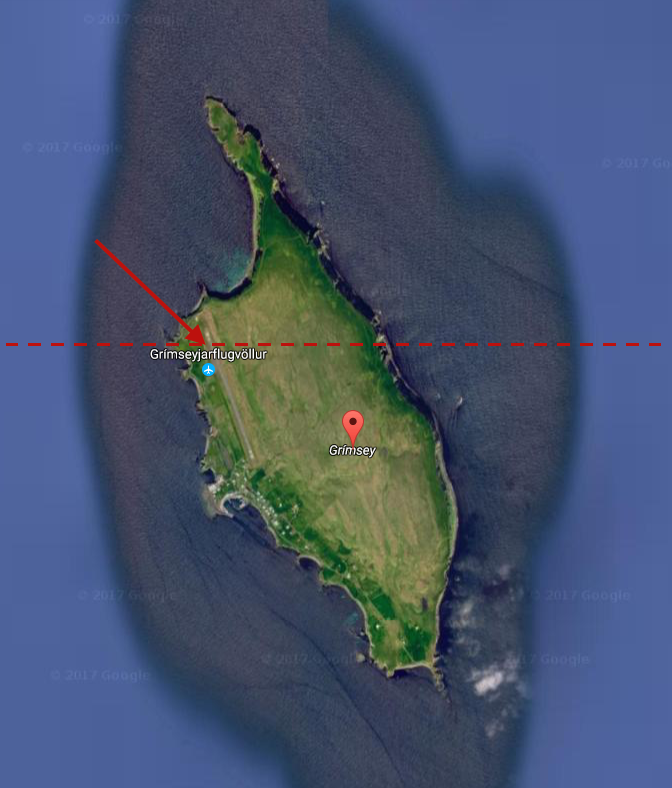 The very northern part of the island comes dangerously close to that magic line, but falls just short. So why is Iceland listed then? 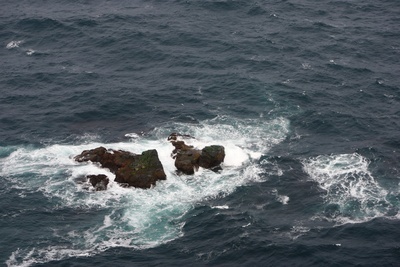 Turns out a minuscule part of Iceland DOES actually cross the Arctic Circle. "I need to go there". Let's back up a second so I can give a little more detail on this fascinating geographical oddity. 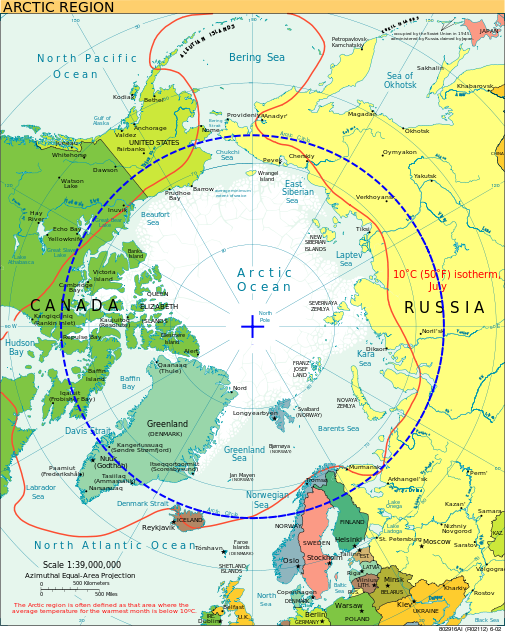 If I were to ask what the latitude of the Arctic Circle is, most would answer by saying either 66°30′, or maybe even 66°33′ to be more exact. Well...it turns out that it's not a simple thing to answer. 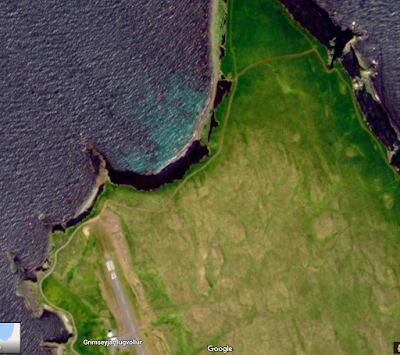 If you can somehow manage to get to Grímsey, there is a monument there marking the Arctic Circle. You can even get a special certificate stating you've been to the Arctic Circle in Iceland. This is actually a major reason that many tourists seek out this diminutive island in the first place. But...where exactly is the monument erected? At what latitude? And this is where it gets complicated. It turns out that the Arctic Circle is NOT stationary. The axis of the Earth is currently tilted about 23.5°. This is known as Earth's obliquity, and it fluctuates over a 40,000 year cycle between 22.1° and 24.5°. What this actually means in terms of the practical location of the Arctic Circle is that it is actually migrating northward a few meters per year. 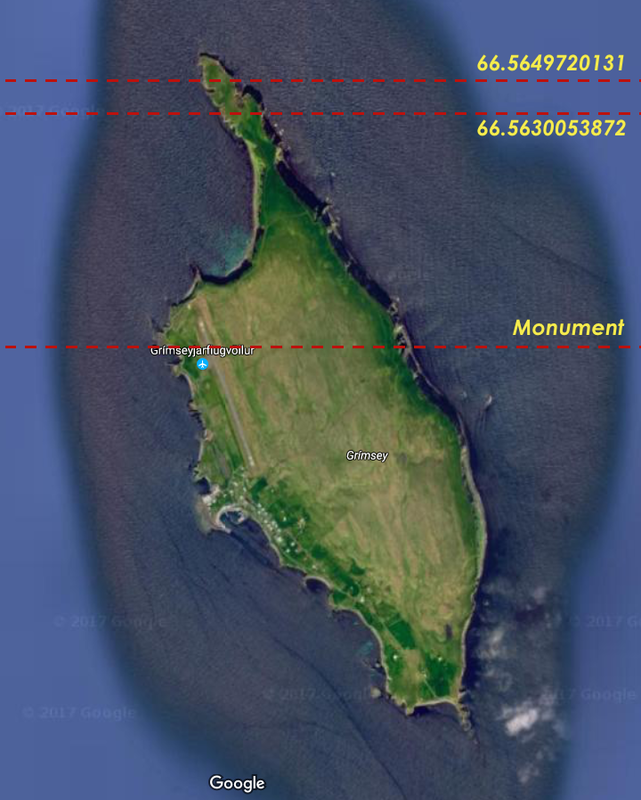 So the very short story here is that the Arctic Circle is not actually where the monument is located in Iceland....but has moved many meters North since it was erected. But where is it now, does it still actually transect Iceland at all, or has the entire country finally fallen South of the Arctic Circle? This tool exactly calculates the angle of the ecliptic of obliquity and will spit out a very precise location of the Arctic Circle on any given date. So let's plug in some numbers and see what it says. For the sake of this example, I am going to use the date of August 30th, 2017 (later this year). One of these values is a compiled result using a technique published by Laskar (1986). This method is essentially an averaged mean of the other methods. The other two values represent actual true values as defined by the International Astronomical Union. The two listed "True" values are so close together, and share six decimal palaces, that they literally would be less than an inch apart on the ground. 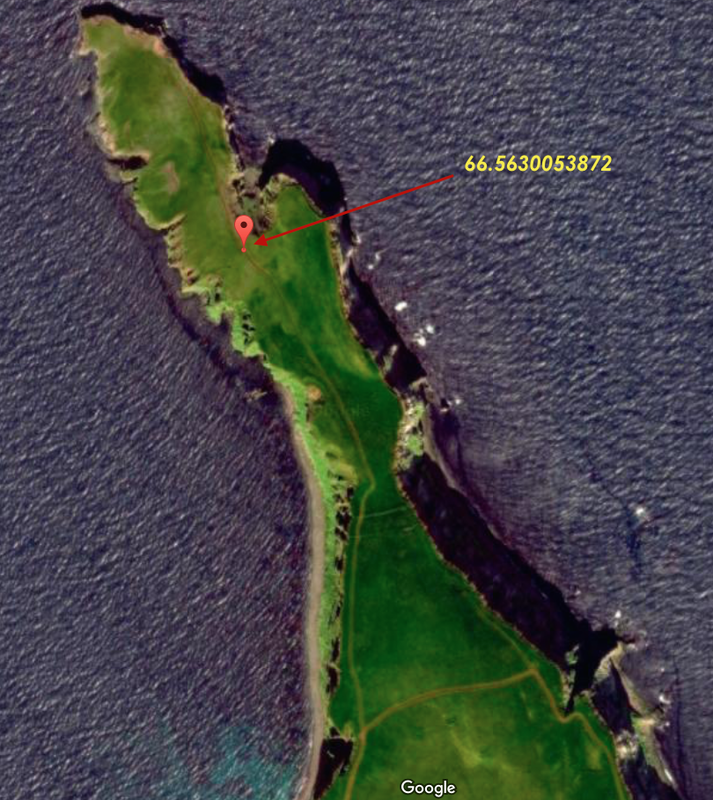 So for sake of simplicity, lets just plot up the two lines in Google Maps to see where they fall. In order to do this, we simply need to subtract these values form 90.0. As it turns out, when we plot up these lines of latitude for August 30th, at noon, they both are quite a bit farther north than the established monument. However, they are still on the island and therefore some part of Iceland is JUST BARELY above the Arctic Circle. Zooming in, one could then ask....would it be possible to trek on foot to this Northern part of Grímsey? Well, provided you can get to the island, it looks to be less than a 2 mile hike on some sort of foot path out to the northernmost point. 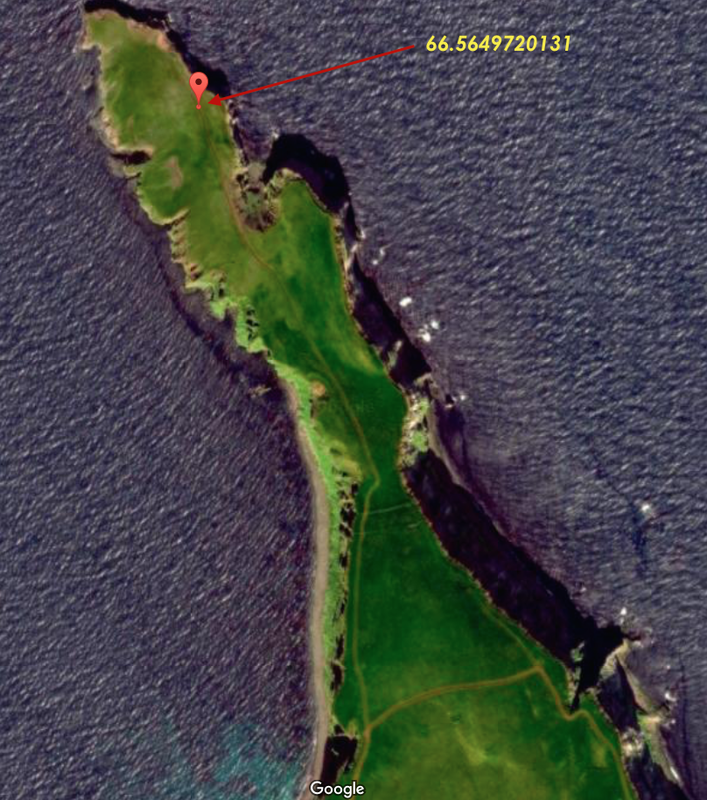 Below is a map showing the zoomed-in northern peninsula with the two calculated Arctic Circles identified ON the foot path. Turns out that there is a very tiny natural "wobble" to the progression off the Earth's obliquity called the "Nutation". 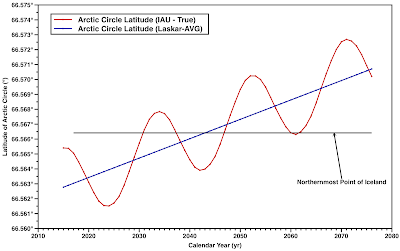 In other words, as the Arctic circle drifts Northward, there is a very slight sinusoidal wave component to it. This means over several years it will drift North, then back South, then back North...all while generally trending North. This will happen until the tilt reaches a minimum of about 21.1° around the year 11,800, at which time the Arctic Circle will finally start trending back South. I played around with various dates using the calculation tool with both the Laskar and the IAU methods, and just as I suspected, the Laskar method just averages out the natural wobble and calculates the approximate "mean" of the latitude line. 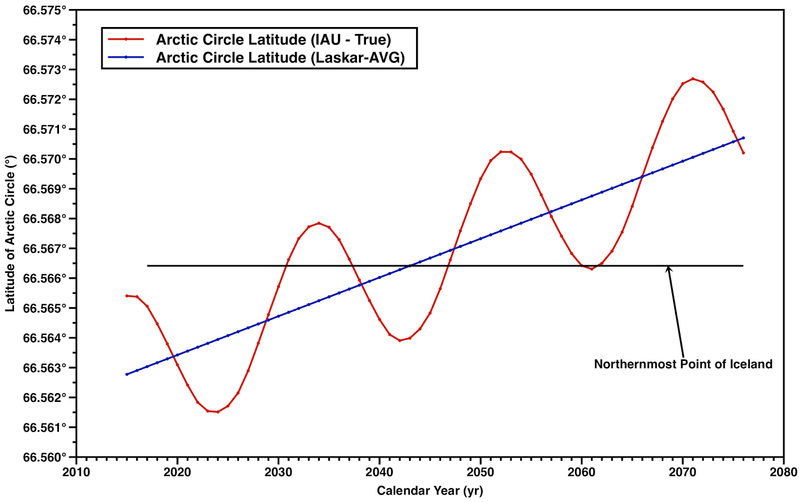 So, in a nutshell, the precise Arctic Circle is the IAU-determined value, but the mean is still pretty close and an easier way to visualize it. You can clearly see that both the Laskar (mean) latitude, and the true nutation-influenced latutide trend North overall...but that the True latitude also has a sinusoidal component to it. I've drawn on the line indicating the northernmost point of Iceland. Turns out, if you also backtrack dates using the online Ecliptic tool, you'll also come to discover that the placement of the monument on Grímsey coincides with a True latitude of the Arctic Circle around the year 1900. This seams reasonable...meaning that the marker was probably placed some time about 100 years ago, near both the turn of the century, and the independence of Iceland as a nation. 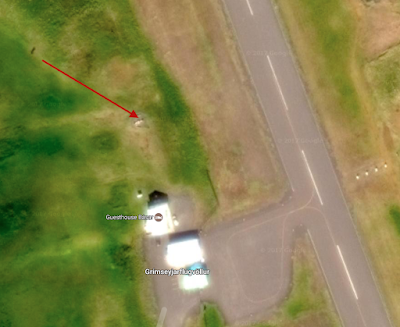 This of course brings us all back to me and my silly fascinations with geographical oddities. You may have wondered why I chose to look at the random date of August 30th, 2017. 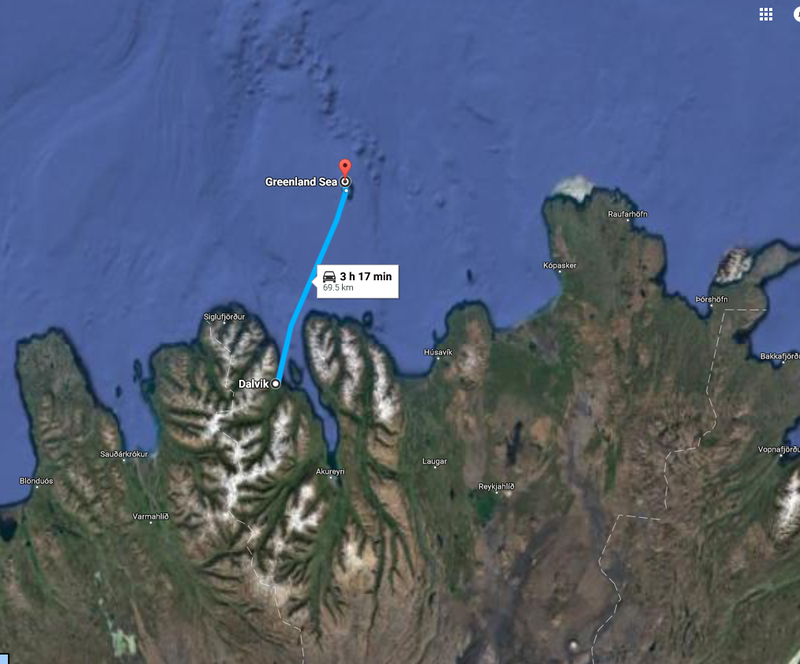 Well, I chose that date, because ostensibly that is the date that I will actually be on Grímsey, walking to the Arctic Circle. As of last night, I now have airline tickets purchased for Iceland, and I will be touring the country for 11 days. 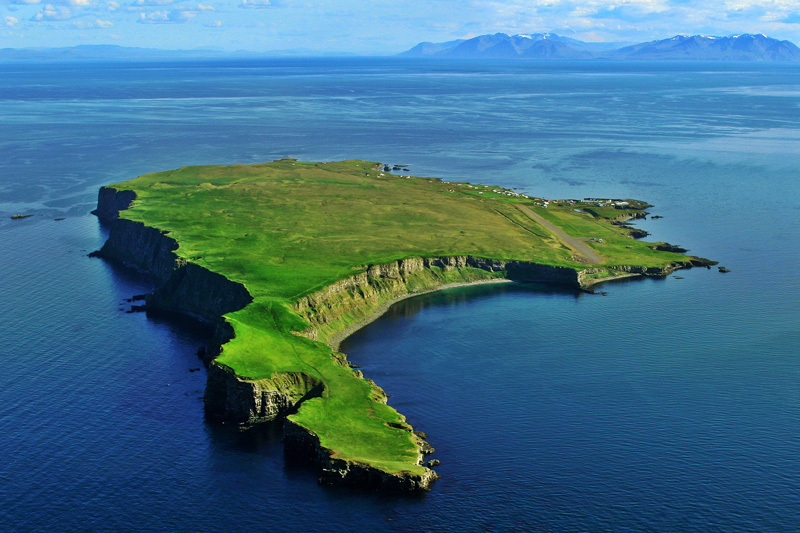 Other than the obvious amazing things to see and do in Iceland (e.g. glaciers, volcanoes, fjords, hot springs, etc), I made one request....I wanted to go to Grímsey to walk above the Arctic Circle. 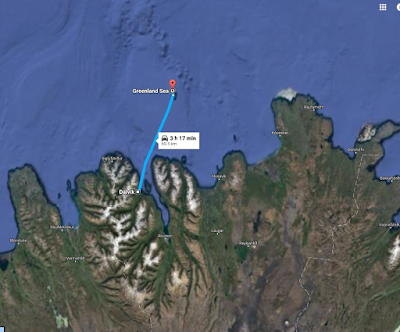 Provided all goes according to plan, and our ticketed ferry does leave on schedule, we should arrive on Grímsey around noon on August 30th. I can't wait. 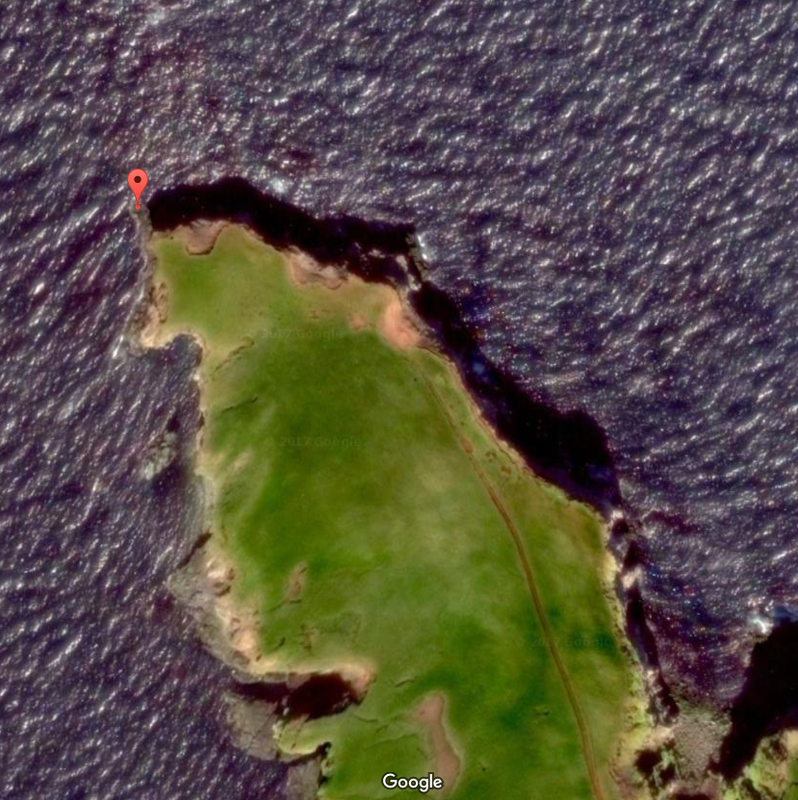 This may be even more exciting than the pole of inaccessibility! The plan is simple. We'll be camper-vanning around Iceland on the loop road (counter-clockwise), and will aim for the tiny town Dalvik, where we'll hop on a 3-hr ferry over to Grímsey for the day. We'll hike around the island, including a jaunt up to the Northern tip, and then head back to the mainland on the return ferry a few hours later. There will be many pictures and GPS screen captures taking place for sure. 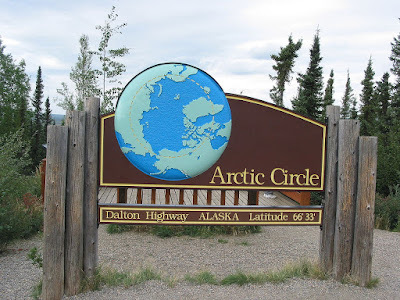 It's funny...for as many times as I've been to the Antarctic, and even the South Pole itself, I've never actually set foot above the Arctic Circle, despite getting quite close back in 2003. As part of a ridiculous road trip from Ohio to Alaska, I managed to play around in Fairbanks only about 200 miles south of the actual Arctic Circle, but never made it any closer. 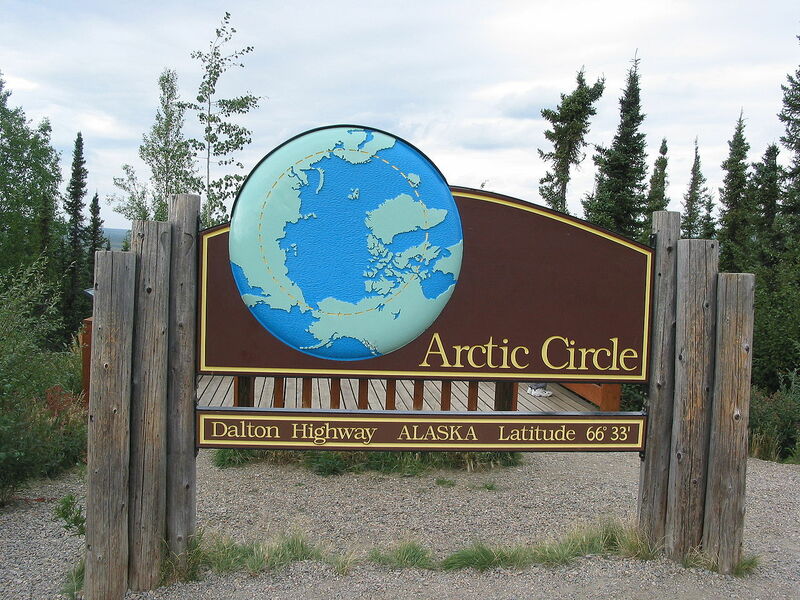 Ive been to England, Northern Labrador, Yukon, and Nunavut Canada....but never above that magical Arctic Circle line. 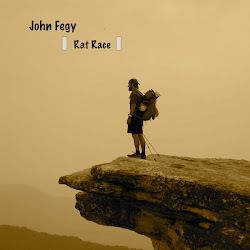 This may finally be my chance (at least until I end up doing field work in Greenland). There will be many more Iceland posts coming as the trip gets closer for sure...so stay tuned. But, if for some reason, Kolbeinsey can hang on and fight off the erosion of the sea until the year 2062...and thus remain above sea level...it would allow for a tiny portion of Iceland to still remain above the Arctic Circle past 2062. Incidentally, even if Kolbeinsey could stay above sea level indefinitely, the Arctic Circle would still finally drift north of even that latitude, around the year 7000. So unfortunately Iceland will still lose it's place above the Arctic Circle until the Earth's obliquity angle makes its way around again a few thousand years later. I guess we'll just have to wait and see!